The Armed Forces offer numerous opportunities for those interested in jobs in criminal justice and criminology, and the United States Coast Guard is no different. An agency with a dual role under the Department of Homeland Security, the Coast Guard serves both a military and law enforcement function which provides unique opportunities for both civilian and enlisted law enforcement personnel. It is especially true for special agents of the Coast Guard Investigative Service. Created in 1915 with the establishment of a chief intelligence officer, the Coast Guard investigative and intelligence services - then under the Department of the Treasury - gained respect, credibility and fame during the years of Prohibition, when investigators worked closely with other federal agents from the FBI and Treasury to bust smugglers and rum-runners around the country. After Prohibition, Coast Guard investigators provided critical assistance in keeping America's coastal regions and ports secure during World War II, thwarting the attempts of would-be saboteurs. Over the decades, the Coast Guard Investigative Service has increased in size and responsibility and was officially separated from the intelligence function in 1986. Today, the Coast Guard and its special agents operate within the Department of Homeland Security. 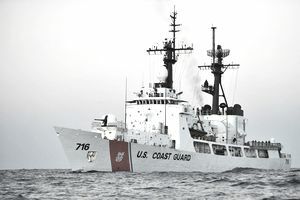 The organization has a wide array of duties ranging from counterterrorism to drug indication, as well as internal investigations of Coast Guard personnel. Like investigators from other branches of the armed forces, coast guard special agents are responsible for a variety of investigations. Given the Coast Guard's unique role, CGIS special agents are expected to handle all types of cases involving criminal law, military laws and regulations and maritime laws. The Coast Guard has several areas of responsibility, including marine environmental protection; port, coastal and inland waterway security; search and rescue; drug interdiction; immigration enforcement and counterterrorism functions. CGIS special agents play a role in all of these responsibilities, providing support, criminal intelligence, and investigative services to augment the general law enforcement functions. In addition to criminal investigations, Coast Guard special agents are responsible for investigating major violations of the Uniform Code of Military Justice. Special agents serve as internal investigators and operate outside of the Coast Guard's operational command to minimize the potential for interference with sensitive investigations. As a law enforcement organization, the U.S.Coast Guard is given the authority to enforce the maritime laws - the system of laws that pertain to sea-going vessels - of the United States. CGIS special agents are often called upon to investigate complex crimes that occur on ships, platforms, and rigs on the high seas. CGIS special agents investigate environmental crimes, false distress calls, criminal violations and incidents of smuggling. Essentially, any major crime under either U.S. law or the UCMJ in which the Coast Guard or its personnel are involved or have an interest may fall under the jurisdiction of Coast Guard investigators. Agents work out of one of eight regions throughout the United States. They provide assistance as requested by other law enforcement agencies, as well as protective services and criminal intelligence. They also work closely with Interpol and other international agencies. Due to the large size of the geographic regions and the extensive jurisdiction of the Coast Guard, agents must be ready and willing to travel and work just about anywhere in the United States and may be placed on international assignments. Coast Guard special agents are fully trained and certified federal agents. The CGIS is made up of military and civilian agents. For civilian agents, a four-year degree and prior law enforcement work experience are necessary. Additionally, like most special agent careers, prior investigative work is encouraged. The CGIS specifically looks for individuals who can work independently, have excellent research skills, think analytically and operate and think under high-stress situations. Potential agents must be physically fit and will be required to participate in a physical assessment. Agent candidates must be eligible for a Top Secret security clearance and must undergo an extensive background investigation, which may include credit checks, past employment, criminal history, and a polygraph exam. Agents attend a 21-week criminal investigation course at the Federal Law Enforcement Training Center in Glynco, Georgia. After graduation, they are assigned as probationary agents to one of the 8 regional offices. The Coast Guard Criminal Investigations Service is made up of approximately 150 civilian agents, 150 military agents and a large number of agents in reserve status. Job announcements are typically made once per year, around June. Job seekers can visit the U.S. government's job site, USAJobs.gov, to look and apply for civilian careers with the Coast Guard. Civilian agents can earn between $47,000 and $80,000 annually, depending on education, experience, and location. Is a Career as a Coast Guard Special Agent Right for You? A career as a Coast Guard special agent is a very demanding one. The scope of responsibilities is vast and varied, and the relatively small number of personnel assigned to the CGIS ensures a hefty workload. CGIS special agents enjoy unique opportunities and challenges, as well as excellent salary and benefits. If you enjoy variety and have a passion for research and investigations, then a job as a United States Coast Guard special agent may be the perfect criminology career for you.